We are faced with a woman’s back. She curls over herself, fetus-like, with her long dark hair obscuring her face. Initially, she appears to be a classic life-drawing subject, her identity subsumed into flesh, positioned for aesthetic beauty and to facilitate students’ pursuit of technical artistic mastery of the human form. The woman’s thoughts are shrouded from us, a mystery. The soft flesh of her curved back takes the majority of space in the painting and attracts our immediate attention. Her pink skin appears so real it seems you could almost touch it. But our eyes are soon drawn leftwards towards the darker-colored creases of her gathered in limbs and lowered head. She seems burdened by emotion but also strengthened, sure in herself and the solidity of her being. She takes possession of her pose. The sole of her right foot turns upward in delicate vulnerability but her left hand is planted determinedly on the floor, perhaps in preparation to stand. Her back is a fortress, confronting our probing, perhaps voyeuristic gaze, containing the woman’s memories and dreams, shielding them in flesh. She gathers up her identity into herself. This is somewhat frustrating. We want to understand her, to connect. As viewers we will her to rise, strong and tall, to turn her face and to look at us. To include us in her experience. Locked out, we watch her from the outside, projecting our own emotions on to her huddled body, trying to relate. How does she feel? Weary? Protective? Vulnerable? Cold after hours of posing? Sorrowful? Hopeful? We cannot tell. 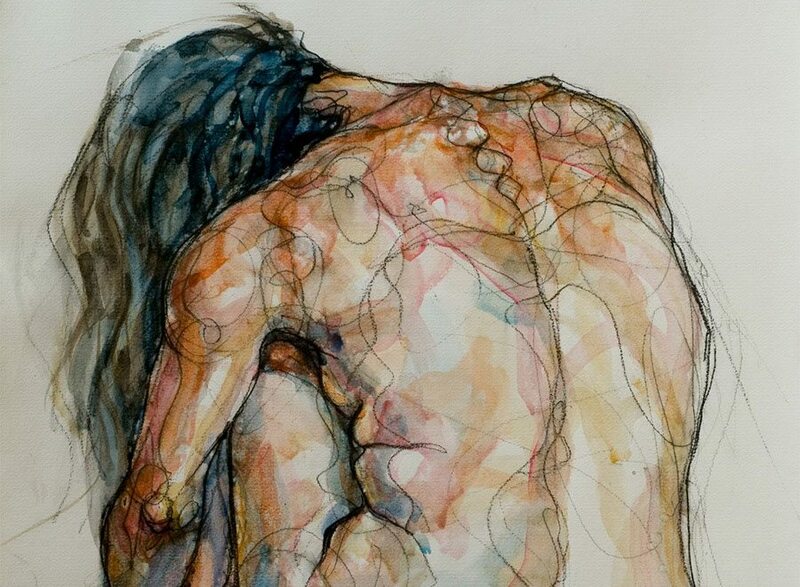 Other people’s bodies hold secrets we can rarely grasp. How it feels to inhabit a singular human form – experience we can only hope to convey through human contact, words or art. But we identify with this curled woman, with the absolute humanity of her flesh and its tie to an inner emotional life. The intertwining of soul and matter, and the personal isolation and desperate desire to connect.